It's that time of year where giving to the less fortunate is top of mind. Every year we partner with a local charity to help those in need and really appreciate the participation of both our employees and the community. 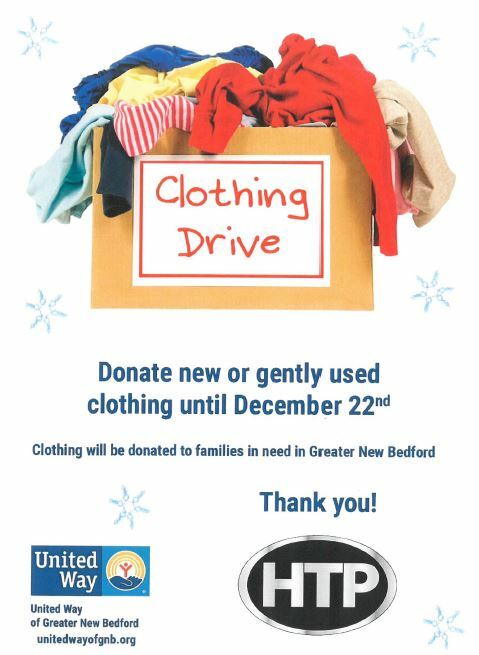 This year HTP will be collecting NEW or GENTLY USED clothing for United Way of Greater New Bedford. We have a designated bin set up in the lobby of our corporate offices in New Bedford and will be accepting donations through December 22nd. Come on down and show support for those who are less fortunate. We are located at 272 Duchaine Blvd. New Bedford Ma, 02745.